When Pivot Cycles presented the brand new 29-inch wheeled Firebird last month, we mentioned that we received a sample for testing. 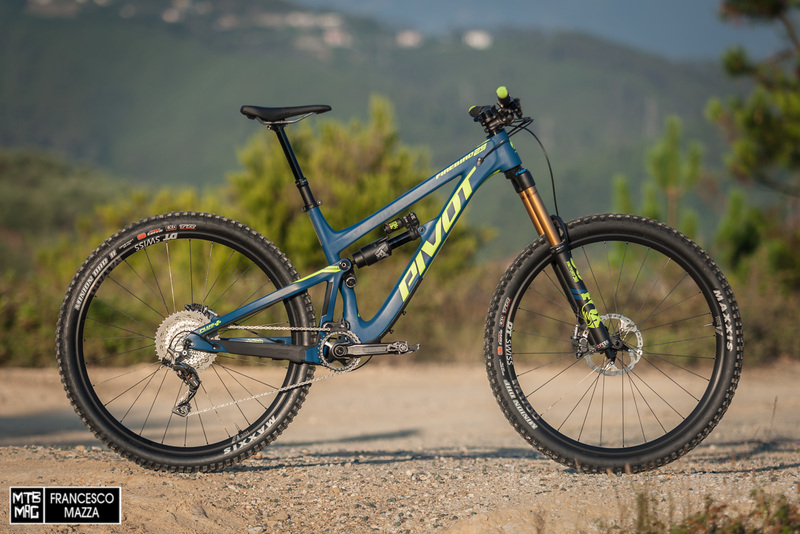 The test set-up we rode is called the “Pro XT / XTR 1x” and although it is placed in the entry to mid range level of the numerous spec options from Pivot, it is still equipped with an excellent level of componentry. Many of which sit at the top of the range with other bike brands. Thanks to the long summer days and warmer temperatures, I was able to test this beast in a wide variety of situations, from the bike park to the alpine trails at high altitude…From the DH slopes to “Enduro” trails, as well as the usual trails behind my house. Multiple situations helped me understand the behavior of a bike with a very aggressive, but at the same time multifaceted nature, as you will discover in this article. The Firebird 29 is built entirely of high modulus unidirectional carbon fiber assembled with a molding process exclusive to Pivot, aimed at providing an excellent level of stiffness and strength while keeping the weight low. The suspension system is the famous DW-Link, keeping with the tradition of the Arizona brand, but with an updated shape of the rear end and new positioning of the linkage plates, compared to the 27.5″ version of the Firebird. The compression curve is strongly inspired by its big sister from the DH world – the Phoenix, but optimized to ensure even better efficiency in pedaling. Also derived from the Phoenix, the linkage plates and oversized axles house and roll on generously sized bearings, much like the Firebird 27.5, aiming at max rigidity of the rear end / chassis. 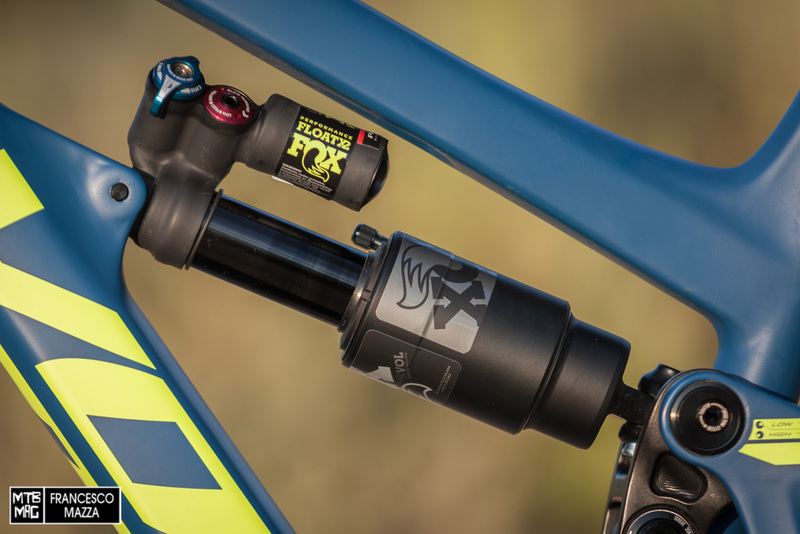 162 millimeters of rear wheel travel is managed by a FOX Float X2 Performance rear shock. This version only has external adjustments for low speed compression and rebound, instead of having both high and low speed adjustments like Factory version which is equipped on the top of the range Firebird 29. 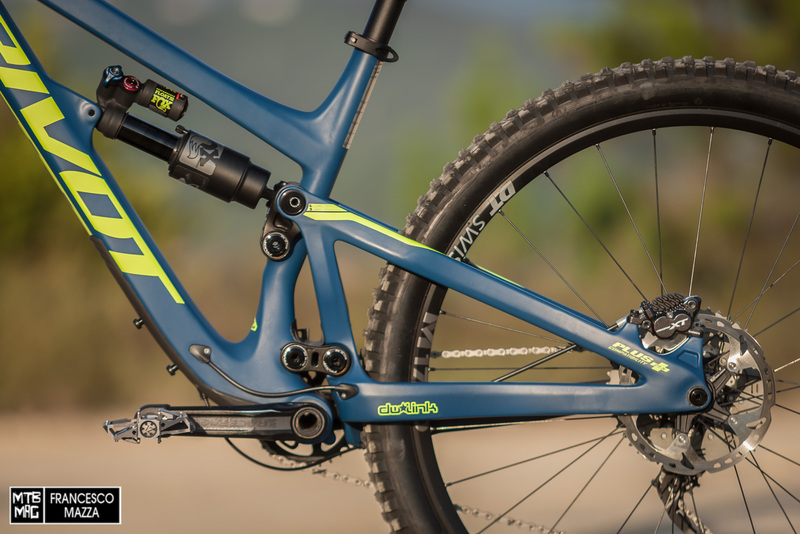 The large volume rear shock meshed nicely with the strong downhill skills of the Firebird and a well configured base tune didn’t leave us yearning for high speed damping adjustments. However, the wide range of adjustments is one of the most interesting features of the Float X2, and in this version compared to the Factory version, you do have less possibility of customizing the behavior of the suspension according to your needs. As you can see in the picture below, the reservoir is located very close to the chassis top tube. For this reason, in order to leave adequate room for movement and flex, Pivot created a recessed dimple in the top tube, in line with the piggy back. 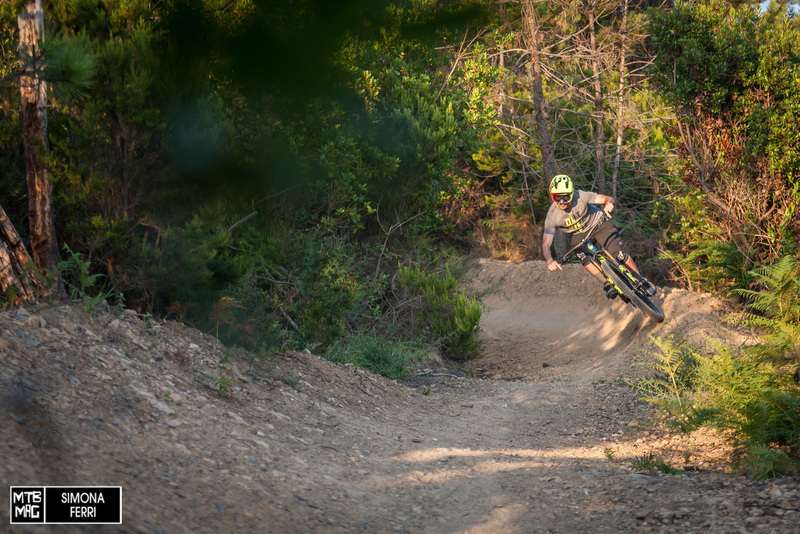 The fork is top of the line – a FOX Float 36 with 170mm of travel and a Grip 2 hydraulic cartridge: a full bodied chassis with smooth, well supported travel never tires your hands even in the hateful braking bumps of the bike park. 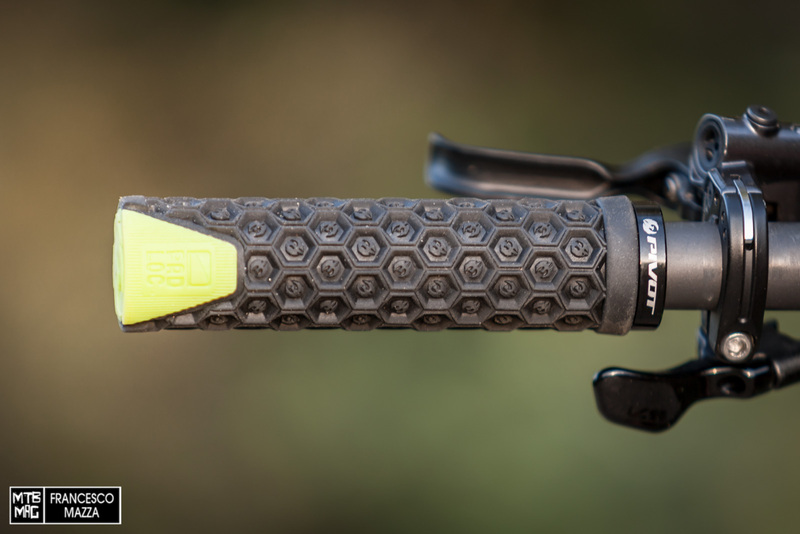 The Grip 2 cartridge allows you to separately fine tune high and low speed damping both in compression and in rebound, to take full advantage of the fork’s high potential, adapting to your needs in different riding situations. Pivot has chosen to equip the Firebird 29 with a 44mm, short offset, so as not to compromise maneuverability and ensure aggressive and dynamic handling in combination with the rather relaxed head angle. 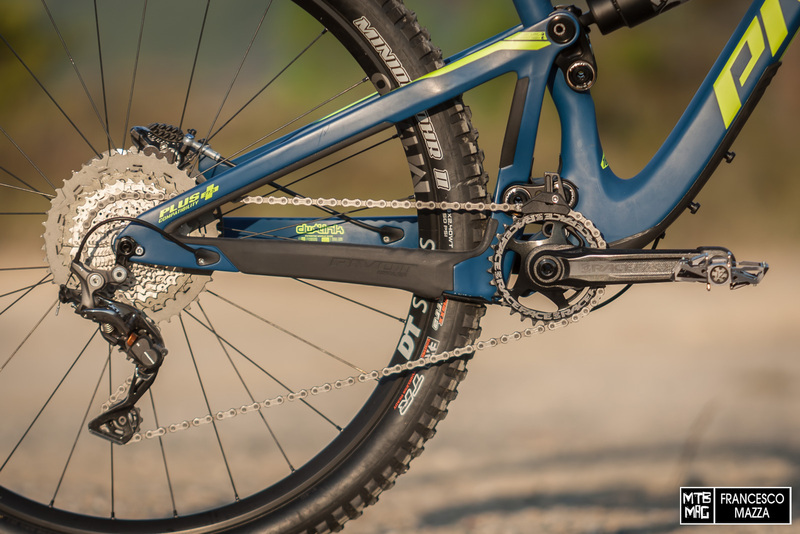 As the name of the build reveals, the drivetrain is made up of a mix of 11-speed XT and XTR Shimano bits. The derailleur is XTR, which was the victim of a clutch seizure problem that fortunately managed to resolve with a little maintenance. It is actuated by an XT shifter. The cassette is XT with 11-46 teeth and is combined with a RaceFace Aeffect SL crank with 175mm cranks (as opposed to what was indicated in the specs with a length of 170mm) and a 30-tooth chainring. The resulting range was adequate, perhaps a bit “short” in some downhill situations but sufficiently agile for the climbs, even those that were particularly technical. The wheels are supplied by DT Swiss, specifically a M1700 set with rear hub equipped with a 36-point Star Ratchet freewheel and a 30mm internal rim width. Both wheels required tensioning during the test and the rear rim was heavily dented after some laps in the bike park. For this same setup you can choose an upgrade to Reynolds wheels if you want to save weight and gain stiffness, with an additional cost of € 1,600. 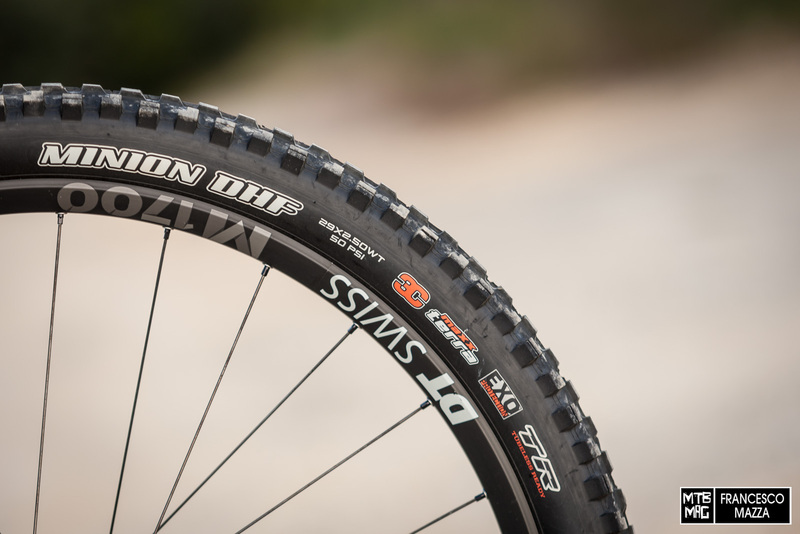 The wheels were configured in tubeless mode, with Maxxis Minion EXO Tubeless Ready tires both in 3C compound, a 2.4 “WT DHR II on the rear and a DHF 2.5” WT on the front. The Firebird 29 also offers the possibility of mounting 27.5 ” Plus wheels, thanks to a massive amount of clearance in the rear triangle. 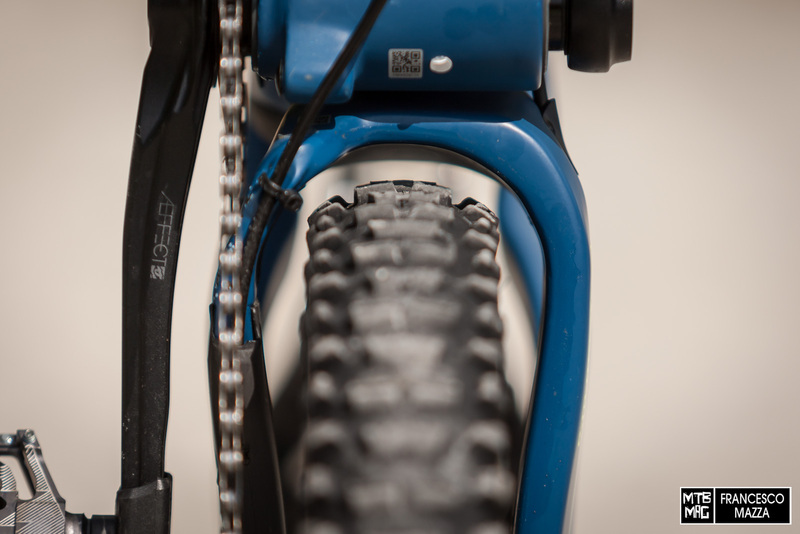 The crucial design element here is the 157mm wide Super Boost hub that allowed the Pivot engineers to move the chain line further outboard and then widen the rear end only where necessary, without interfering with the heels while pedaling. This also managed to help shorten the chainstay length to only 431mm, a number that for a 29 “bike with a 162mm travel it is an absolute marvel in terms engineering. 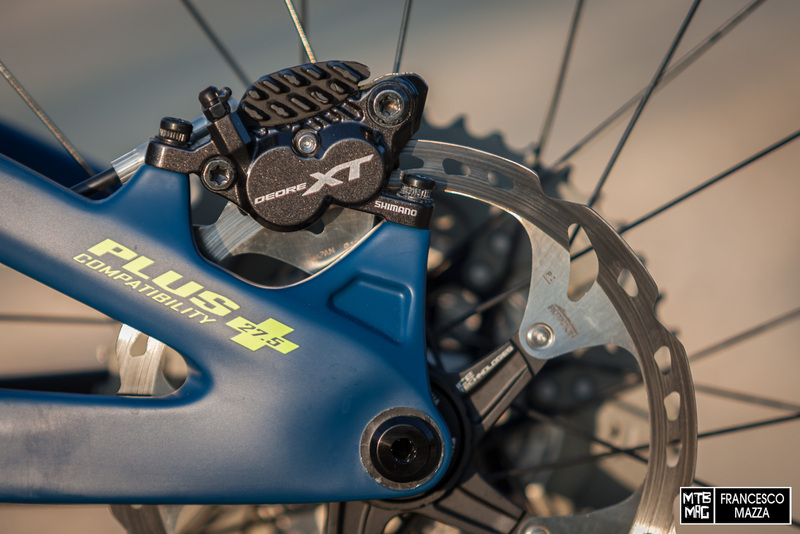 Braking duties are handled by Shimano XT with 4 piston calipers, Ice Tech pads and 180mm diameter Ice Tech Center Lock rotors at both wheels. The power was adequate but in situations such as the bike park or particularly aggressive, long trails, they suffered noticeably from fading and are somewhat undersized due to the very aggressive nature of the Firebird 29. A 200mm front rotor would be worthier spec. The mount of the caliper to the rear end is Post Mount 180, shown below. The Firebird 29 is equipped with different in-house components bearing the Pivot name. The cockpit consists of a handlebar and stem combo with the Phoenix logo. The bar is carbon fiber, 800 mm wide and with 20mm of rise, featuring pleasant angles of 5 and 8 degrees and a 35mm clamping surface. The stem is made of aluminum, obviously with 35mm clamp, and has an a 7 degree rise and a length of 45mm. The handlebar has a diagonal cut necessary to interface with the PadLoc system, in this case a model made specifically for Pivot by WTB, who holds the patent. The PadLoc system has two selling points: the first is to eliminate any risk of unwanted rotation while the second is to offer a softer compound pad on the end of the grip, where the palm rests with the most weight. This way, the grip is able to absorb more vibration, ensuring a higher level of comfort, that was actually felt on the trail, and that I had already appreciated on other occasions. 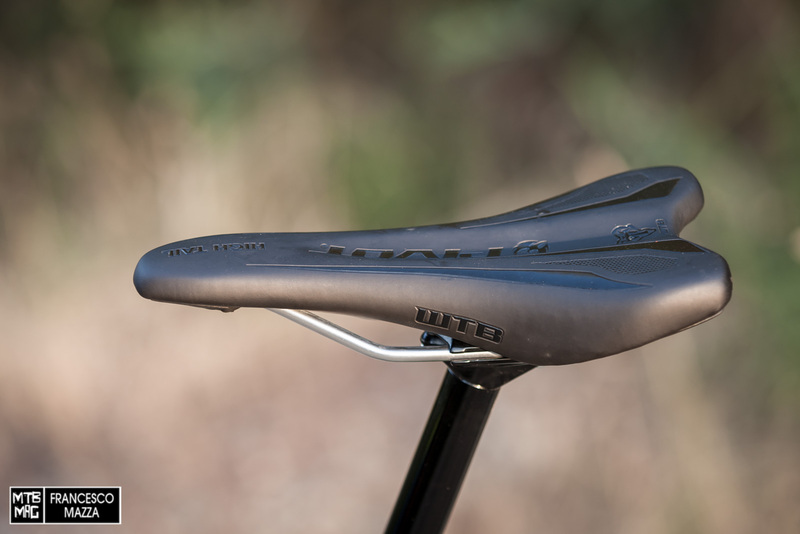 The saddle is also produced by WTB for Pivot and is based on the High Tail, but with more padding for a more gravity oriented use. This is a saddle, as the name suggests, with a pronounced rising tail that creates a very concave seat, certainly particular and different from the saddles which I am used to, but still quite comfortable, once you find the right position and angle. 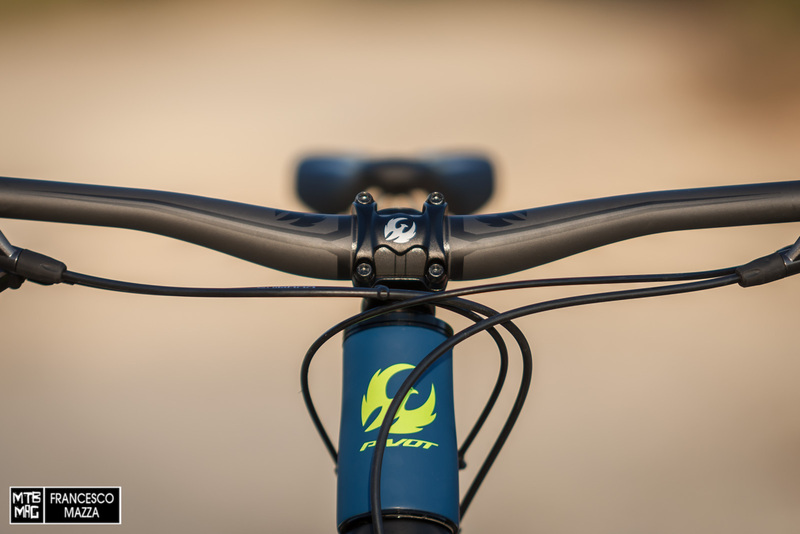 For all versions of the Firebird 29, Pivot has provided two options for the dropper seatpost, depending on the size. 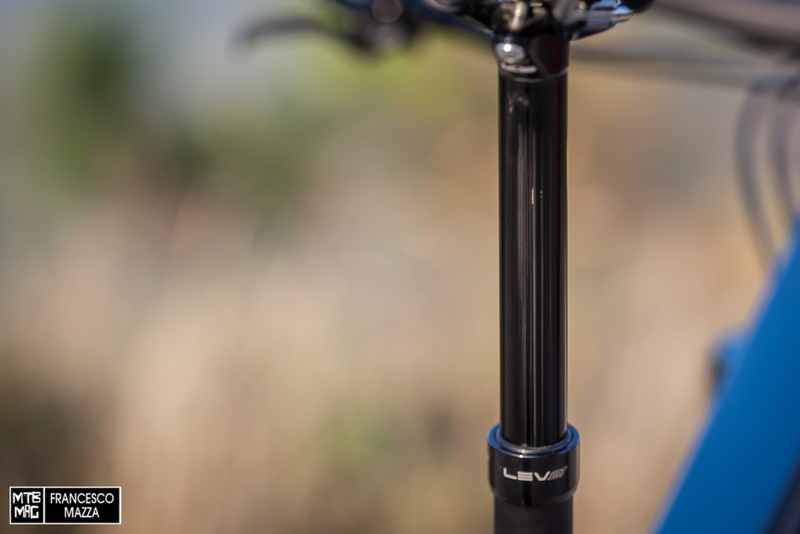 For the two smaller sizes, the post is a KS LEV Integra, with 125mm of travel for the small and 150mm for the medium. The large and XL sizes instead feature a FOX Transfer with 150mm of travel. Having a size medium for our test, the dropper I used was a 150mm LEV that didn’t exactly match the value of the rest of the bike. During one of the very first laps and then on two other occasions, the lockring was loosened and before I noticed it, due to noise caused by the play, within a few kilometers the sliding surface was visibly scratched, as shown in the following picture below. The posts action had however always been rough and had initial difficulty in lowering. As usual for the US brand, the details of the frame are very accurate. The entrance of the cable routing inside the frame is neat and precise thanks to special gaskets that fix each cable to the entrances by means of an Allen head screw. However, the gaskets do not seal the entry doors and therefore do not completely prevent water from infiltrating the inside of the frame when washing the bike. 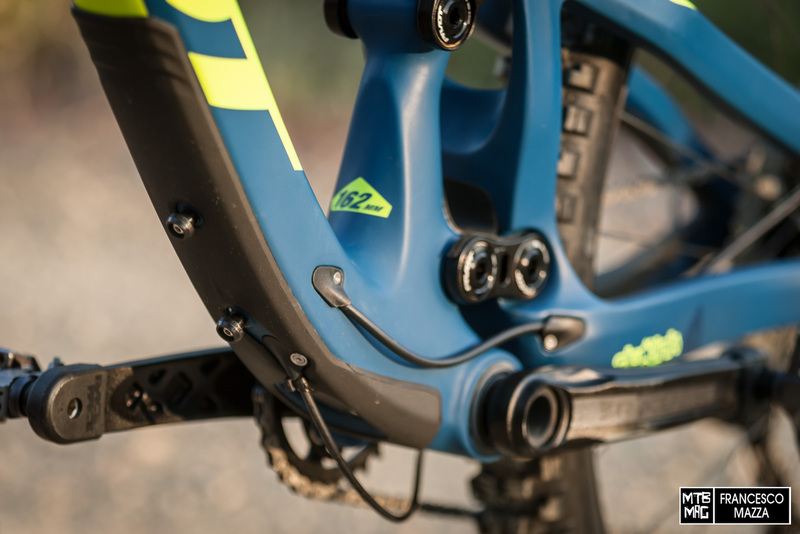 The internal routing is not guided by a sheath, so the movement of the cables inside the frame can generate some noise during riding. The brake hose exits in a straight, clean fashion from the side of the down tube above the bottom bracket housing and re-enters in the chainstay, without creating interference during use, while the shifter cable passes under the bottom bracket shell. The lower part of the down tube is actually protected by a strong, pre-formed rubber shell to perfectly follow the shape of the frame. The same care is taken with the protective guards on the drive side, to protect it from the impacts of the chain. 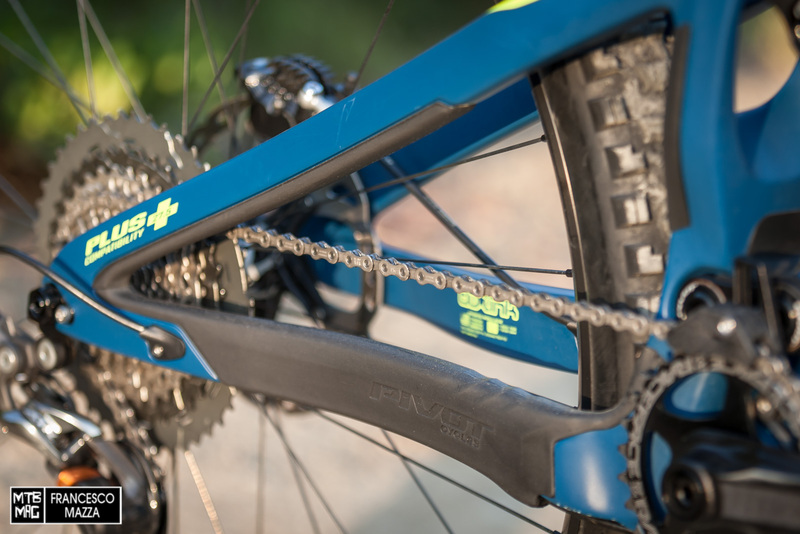 On the other hand, there is no metal plate to protect the chainstay from the chain and chainring, which is standard on the 27.5 Firebird as well as most of the other models from Pivot. A detail that would have played an important role given that at that point of the rear end, the paint started to get chipped because of the repeated blows inflicted by the chain during riding. 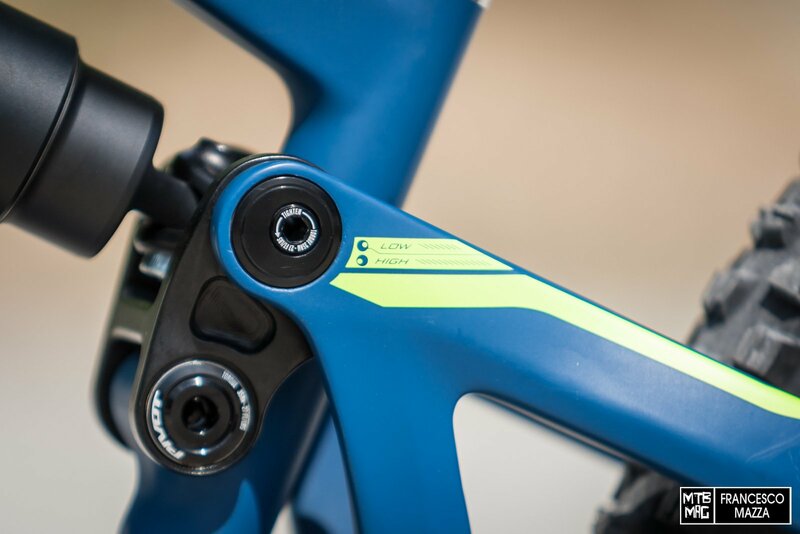 Despite the lack of space inside the main triangle of the frame due to the positioning of the shock, Pivot did not give up on equipping the Firebird 29 with mounts for a bottle cage holder, choosing to apply them on the underside of the down tube. A position that is certainly impractical because it is not accessible while riding and very much exposed to dirt, but in these hot weeks I was able to appreciate the possibility of taking my bottle anyway, even on the shortest laps. Specifically, I chose to use a Fabric Cageless to avoid the sight of the empty bottle holder, which was rather ugly at that point on the frame, when I did not use a bottle. 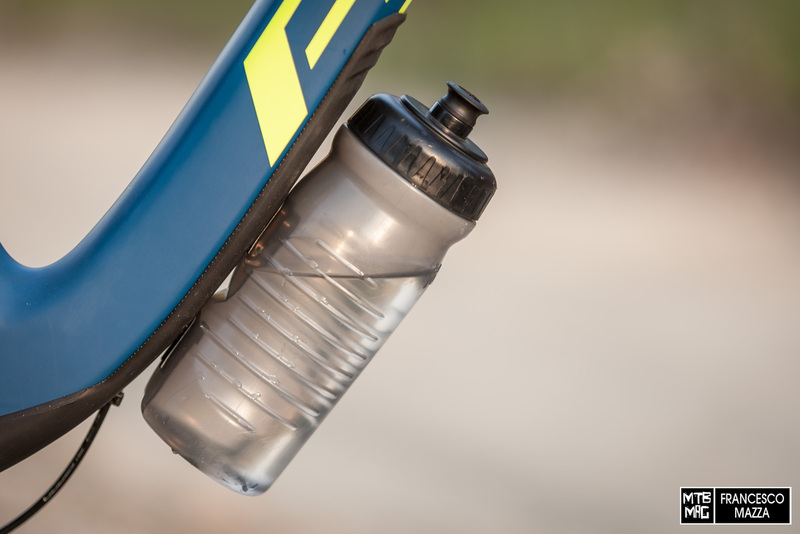 It should be emphasized that the thickness of the downtube guard on the frame creates greater interference and makes it more difficult to place and remove the Cageless bottle, but at the same time, it also ensures that it is not inadvertently lost in very rough sections, thus resolving this well-known problem of the Cageless bottle. 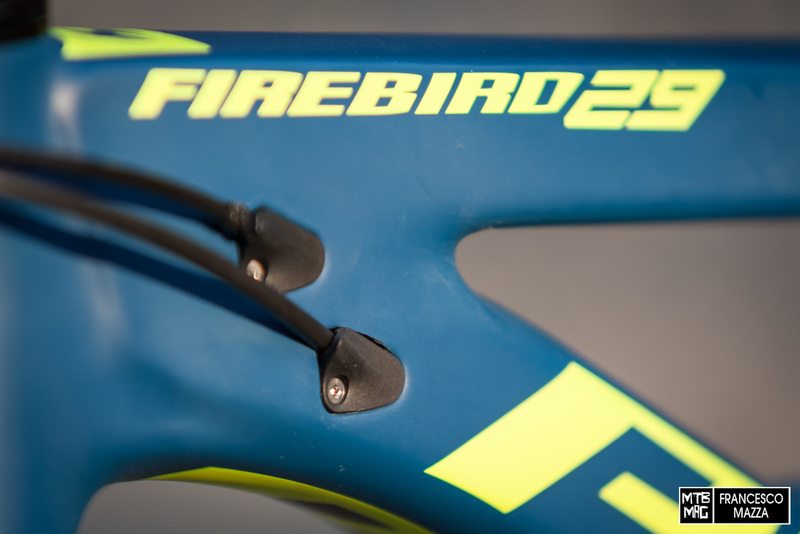 The Firebird 29 is equipped with a “flip-chip” insert, capable of modifying the geometry by 0.5 ° with regard to the head and seat angles and by 6mm with respect to the height of the bottom bracket. This option can be used both in with 29-inch wheels, to have two geometry options, and to mount 27.5 wheels with Plus tires, retaining similar geometry to those of the 29-wheel version. As for me, I used the Firebird 29 mainly in the low position, in which I believe the full potential of this bike became obvious. 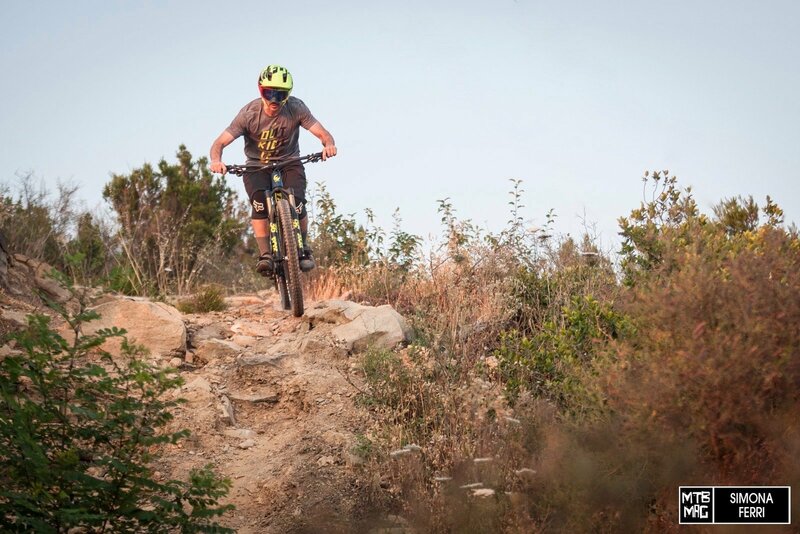 Although, the high version can bring some advantages in the wildest trails, providing g reater clearance at the cranks, pedaling between protruding rocks. 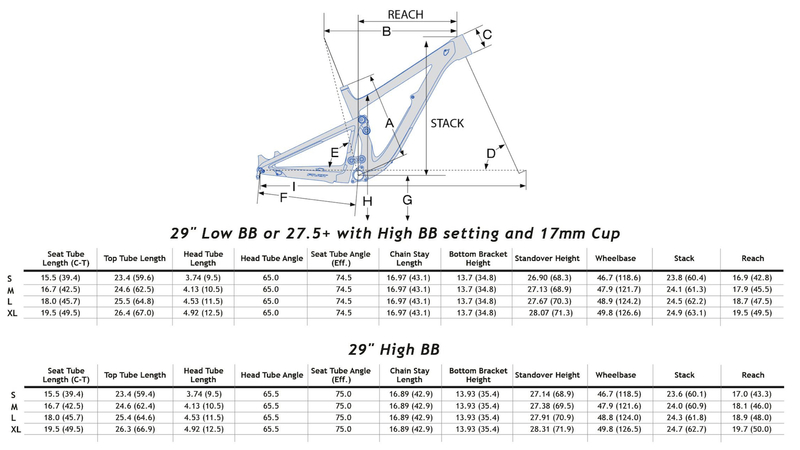 We spoke of a head angle of 65°, combined with a bottom bracket height of 348mm, but to an especially short chainstay, at only 431mm, which greatly affects the performance of the Firebird 29, as I will explain later. Without excessive sinking of the suspension, uneven, steep and tortuous terrain doesn’t phase the Firebird 29, which is always surefooted up front and easy to maneuver, with excellent traction at the rear wheel. On brutally technical, high mountain trails I appreciated the maneuverability and sprightliness … You just have to remember that at the end of the day, you have a bike that’s more “cumbersome” than any trail bike, and simply take advantage of its greater inertia in order to squeeze in some of the tougher climbs. The true confirmation of the expectations, however, I had on the downhills, where the Firebird 29 put a smile in my face in the first few turns. 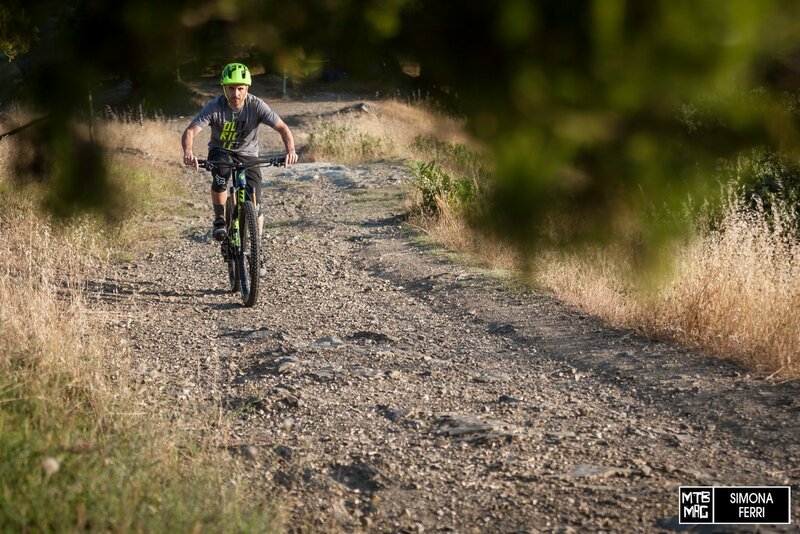 A mix of the following riding characteristics make it a high performance and extremely fun bike: agile, manageable, stable, comfortable, responsive and precise. Agile: entering turns and marveling at how tight you can wrap them while still maintaining speed, thanks in large part to the very short rear end in proportion to the reach; change trajectory quickly and you will always feel the bike respond in a stable and precise way. A dream to handle: the Firebird 29 easily follows every command, intuitively, without requiring more strength and input than necessary. The reduced offset combined with the relaxed head angle ensures maneuverability and makes the steering lighter. Stable: the Firebird 29 manages to sustain high speeds, even in the middle of the battered trail, without losing excess speed. Facing steep and very rough sections, you always have confidence in the front end, feeling solid and firmly planted to the ground. This is merited by a combination of aggressive geometry and the excellent behavior of the FOX 36 with Grip 2 cartridge. 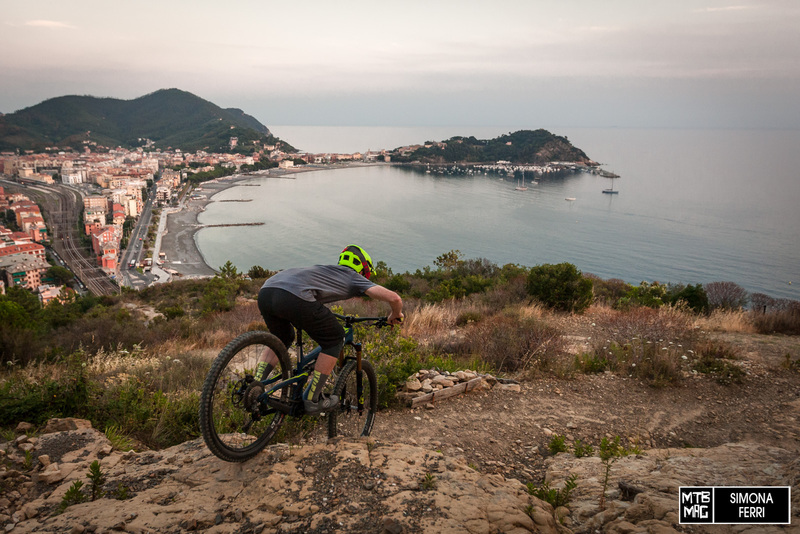 Comfortable: dispersing too much energy to maintain rhythm is never productive on two wheels, whether you’re at an enduro race or lapping the bike park. I really appreciated the Firebird 29 because it doesn’t transfer excessive vibration to the body and didn’t require too much energy while riding. In a nutshell, it was not tiring to ride. Lastly, it had just the right amount of anti-rise, which causes the suspension to stiffen slightly during braking. Reactive: the supportive, yet fluid and progressive suspension of the Firebird 29 provides an extremely dynamic ride in all riding conditions. The rear shock works really well in the central part of the travel, being supportive, but always ready to absorb the rough bits and harsh landings, even in the most demanding situations. 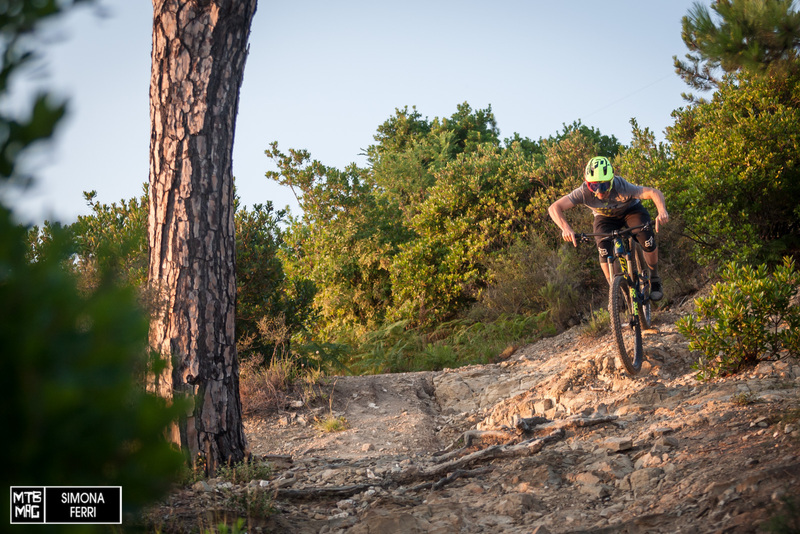 Precise: choose a line and hold it, regardless of how rough and uneven the terrain is, it’s always easy and intuitive and that allows you to focus on the next section of trail without having to care too much about what passes under your wheels. A feature that makes the Firebird 29 highly capable in terms of simplifying riding and conserving speed. 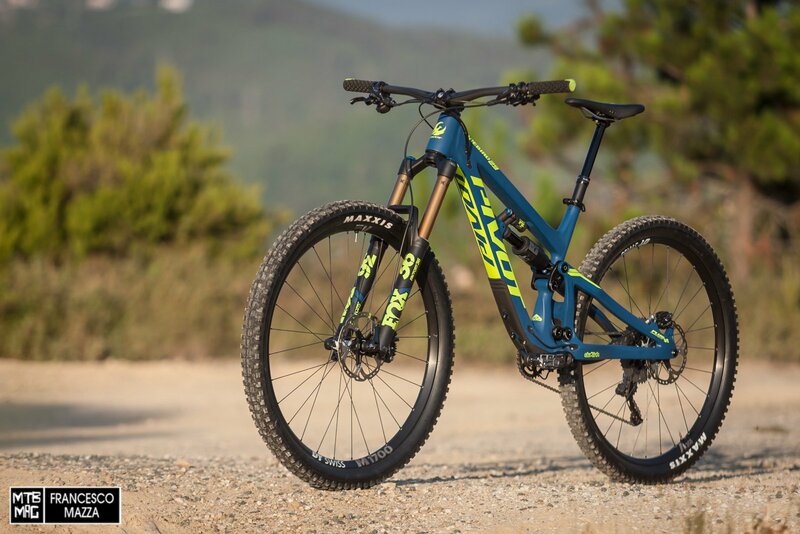 Pivot has created a bike with an exemplary balance between geometry, suspension behavior and frame stiffness. Born for enduro racing, but able to emulate the performance of a DH bike in the bike park, it’s ready to devour long trails in the mountains. The Firebird 29 is an aggressive bike, but it’s not exhausting to ride. It’s very intuitive, and you can appreciate it even at a quieter pace, but its most excellent performance attributes still encourage and reward a dynamic riding style and rhythm. The new Firebird 29 is available in two colors and in a fair amount of spec levels, some of which provide an upgrade such as Reynolds carbon wheels with a relative price increase.